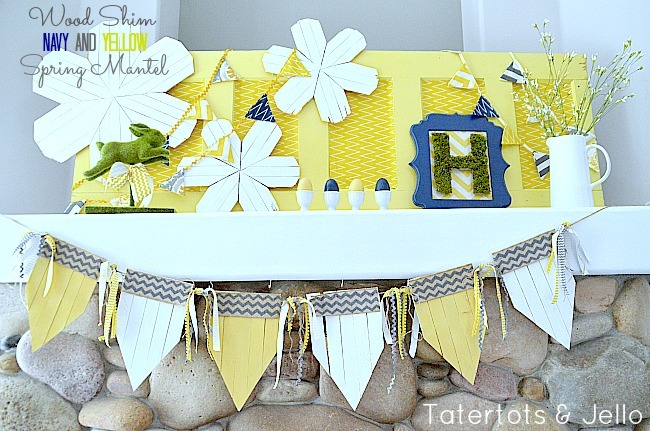 Spring Wood Shim Flower and Bunting Mantel! I love updating my mantels for different holidays and seasons. The one in our living room is a little more formal — this year I went with a blue and green theme with succulents. 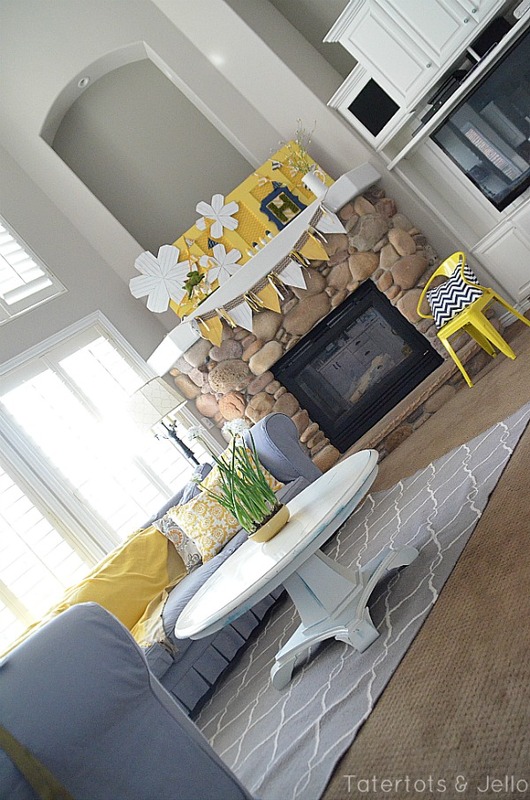 For my family room, I love to go with a more casual, bright mantel. And since I just updated my kitchen open nook in yellow and navy, I thought it would be fun to make my mantel kind of coordinate with that theme since the two rooms are open to each other. And I love yellow for Spring. I bought some wood shims a couple weeks ago and I wanted to experiment to see what I could make with the shims. 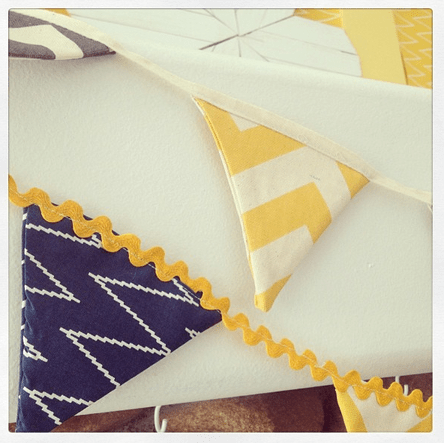 I ended up making some pennants for a bunting. And when I was playing around with them, I fitted the angled ends together and thought I could make them into a flower. So with my sweet husband’s help, we did. Did you know you an buy TWO different sizes of shims?? We made a large flower out of ther bigger shims and a couple of smaller flowers out of the smaller shims. The pennant bunting we made out of the larger shims. I will post a more detailed tutorial on how to make the wood shim flowers and bunting soon. 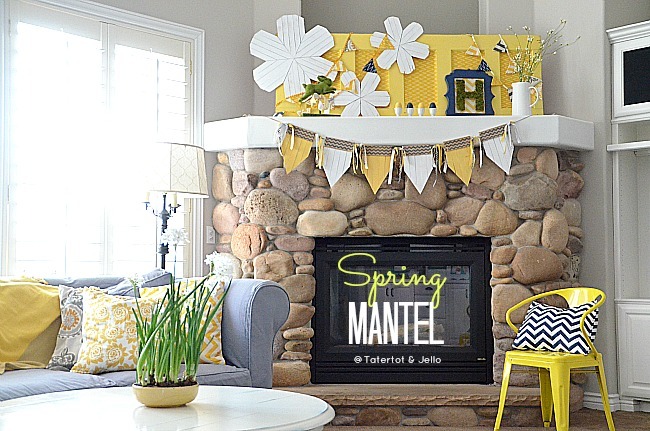 But in the meantime, here is how I made the Spring Mantel. 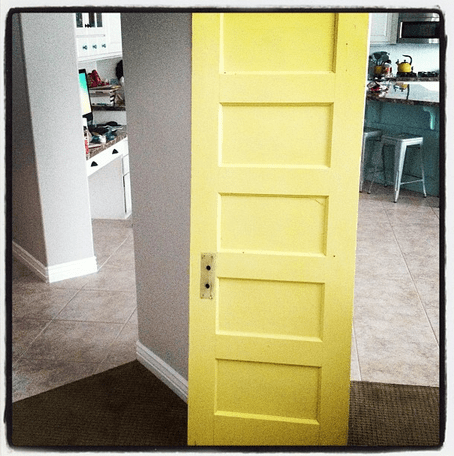 I took the old vintage door I have used for my Spring mantel last year and also for my Christmas mantel and I spraypainted one side yellow. Then I cut out panels to go in the panels of the door with fabric. I attached the fabric to the painted door with glue dots. I also made a couple of fabric pennants with fabric from fabric I also had made into throw pillows for my couch. And then I took a frame and framed in some yellow chevron material and took a chipboard letter H and cut some moss to fo on top of it. 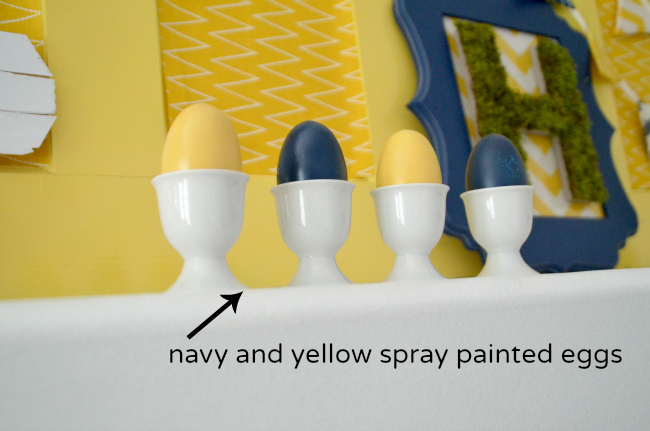 Another thing I did was I spray painted some resin eggs yellow and navy to match the decor. I added a colorful bow to a little moss bunny. And I added some pretty greens to a classic white pitcher. And look at my bulbs!! They finally bloomed – yay!! I absolutely love looking at them. They make me think that Spring is right around the corner. And I love having them on my little coffee table — they smell so good! Seeing my little yellow and navy space down the hall from my front door makes me so happy. I love that the mantel echoes the happy yellow of the little yellow table I spray painted that I inherited from my grandmother. And here’s what it looks like going into the kitchen. What is making YOU happy this Spring?? 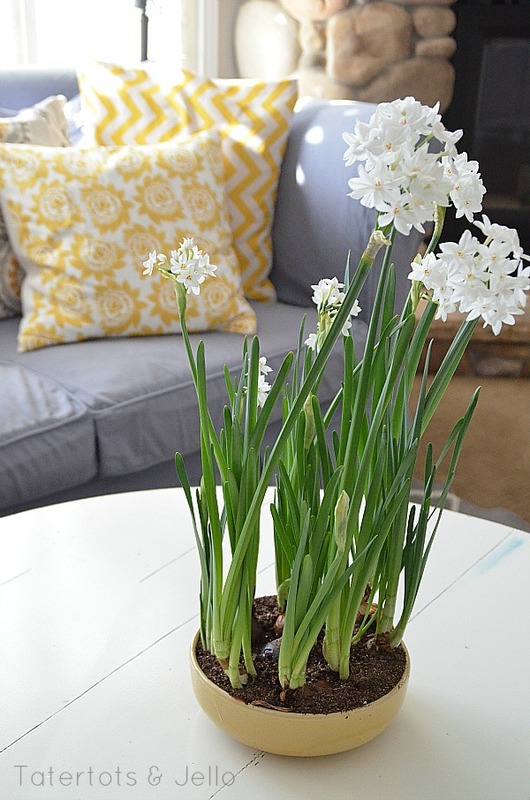 Have you made any SPRING projects, or is there a project that YOU are excited to make for YOUR home?? Share YOUR ideas with us in the comments – we would LOVE to know what inspired you!! Spring Navy and Yellow Interchangeable Bow Wreath! Navy and Yellow Spring Kitchen Nook Update! 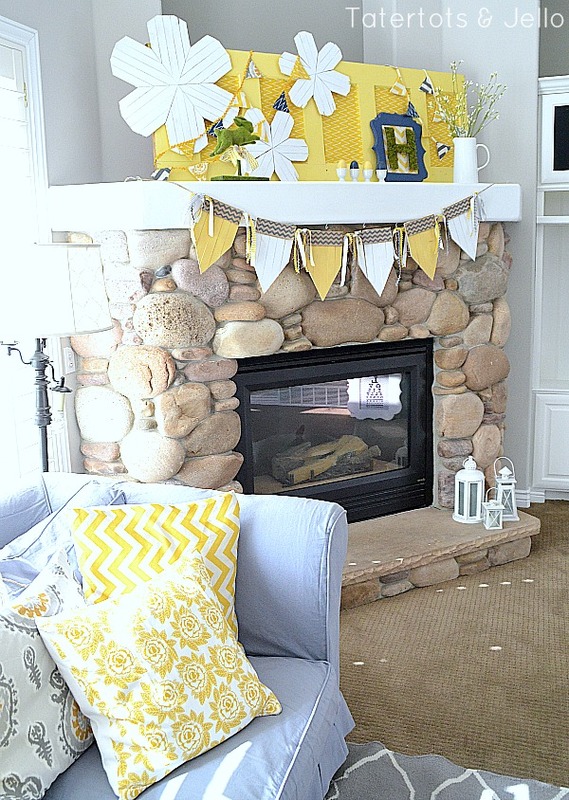 5-Minute Spring Doily Garland – brighten up YOUR home! 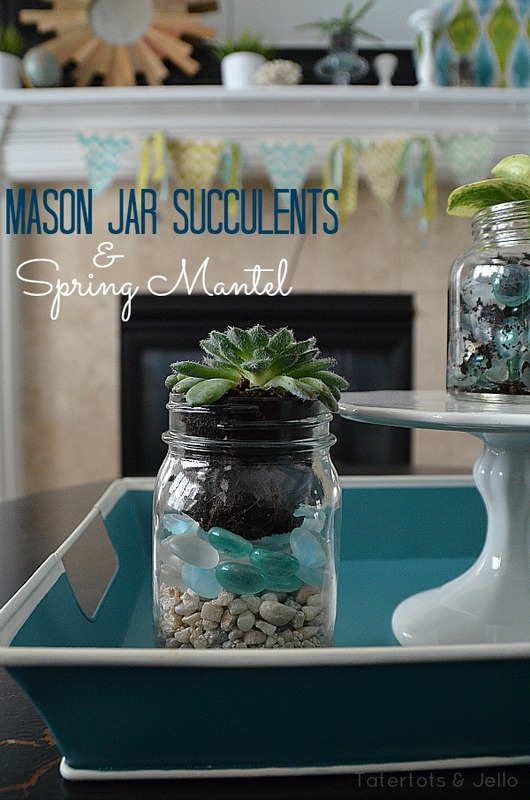 Spring Mantel and DIY Mason Jar Succulents! 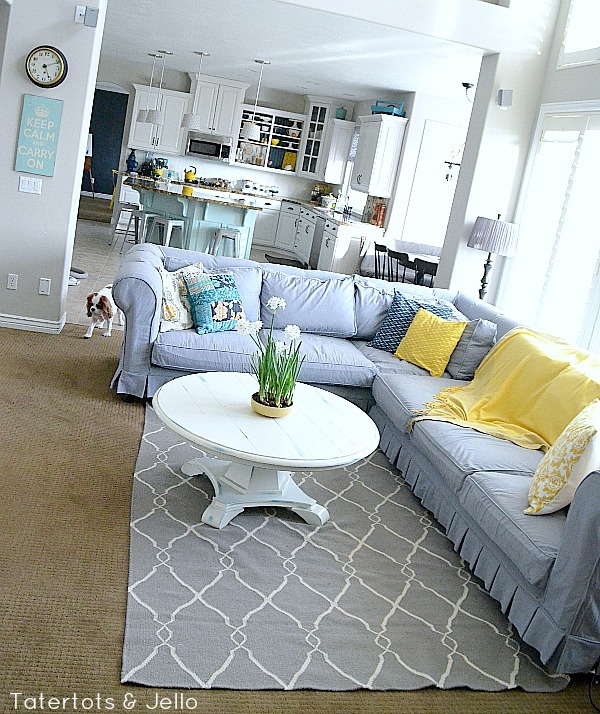 Vote in the Rescue Remodel Contest – And You Could Win a $100 IKEA Gift Card! 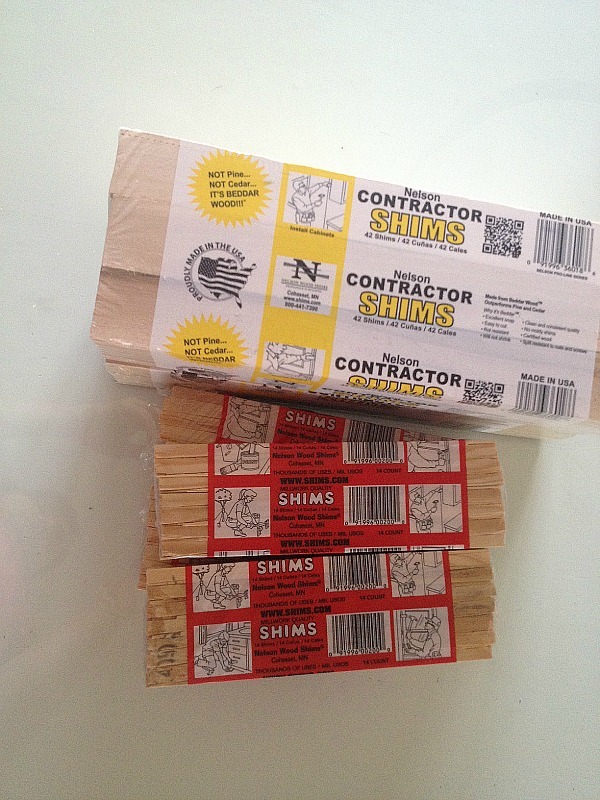 Nelson Wood Shims » Thanks! Your contractor shims are awesome to work with — less brittle and better wood than regular shims. Looking forward to that bunting tutorial!!! Jen- I came upon your page by accident but fell in love quickly! I enjoy everything you do and your house is gorgeous! Thanks for sharing! OM Yumminess! 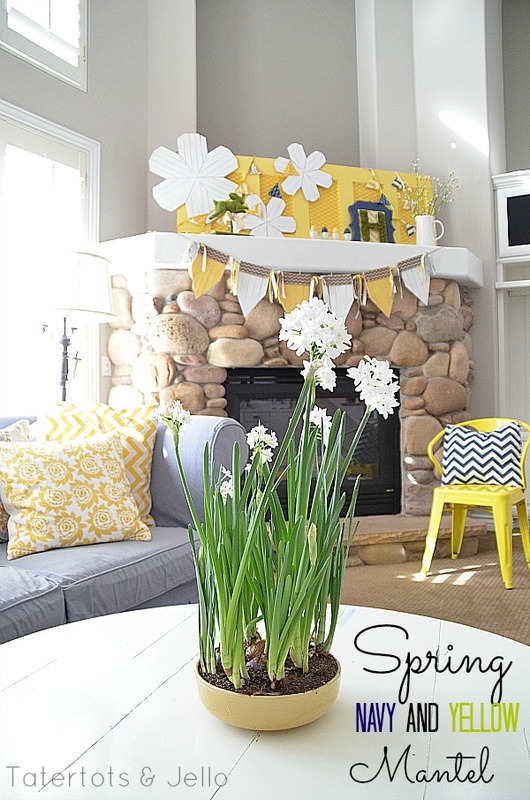 Where did you get the yellow white pillows too . .
Love, love love the spring mantel. Love the yellow…so bright and colorful!!! Thanks Crystal!! It really makes me so happy to see each day. Thanks for the sweet comment! Thanks Jen!!! You are so sweet. Happy Sunday to you!! I love your color choices. You always choose such fun, saturated colors. So happy. Ok, I do have to ask you how heavy is this bunting? I’ve had the toughest time getting even fabric bunting to stay up. I’ve resorted to command hooks. But I was curious about what you’ve tried that has worked for you. Your projects are always so original! So inspired! Thanks! So nice and cheeful! I just painted an old desk in Annie Sloan Yellow, trying to decide what to do with it! Your desk sounds so pretty!! I just love yellow. It’s so happy! So fun! I love the ideas with the wood shims! Tell me about the moss bunny-I want one! Oh Jen, I just love this! Possibly my favorite mantel you have designed so far. It just makes me happy to look at it. So many gorgeous textures and colors. Awesome job my friend! Thanks Kara!! Your comment really made my day. I appreciate it so much. I hope things are going well with you. What a cheerful arrangement! I love your patterns and color selections. The mantel turned out so well. You have given me food for thought with Easter coming soon. Thanks Mardell!! I appreciate you taking the time to leave a comment. I hope you are having a great weekend! Oh yay!! thanks Lisa – that was what I was going for! That looks so gorgeous! 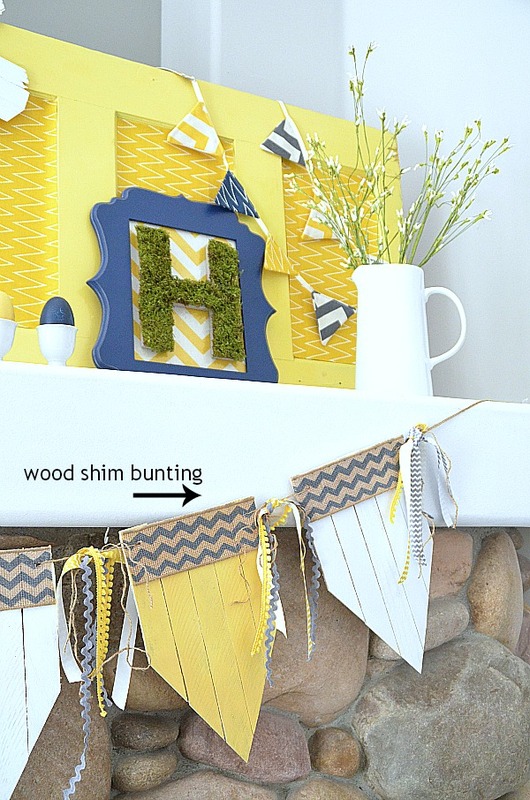 I can’t wait for your tutorials with the shims – I purchased some a few weeks ago and have been wanting to try some new crafts with them! The tutorial will be coming up in April. I am working on a whole wall of wood shim flowers and can’t wait to post about it! Jen I love this! The color is the perfect pop and it is truly different which I love. Thanks for the inspiration!! You are welcome Deneen!!! I appreciate you stopping by and leaving a comment. I hope you are having a great weekend! Thanks so much for pinning – I appreciate it so much. You are the best and sharing on youf FB! smooch! it’s pure happiness in your beautiful home, jen. so warm, cozy & bright. your home really is a true reflection of you!!! You are so sweet. Thanks!! I really hope to make my home happy and a fun place to be. That’s my goal. Thanks for the comment my friend! Thanks so much!! I appreciate your comment and taking the time to stop by! 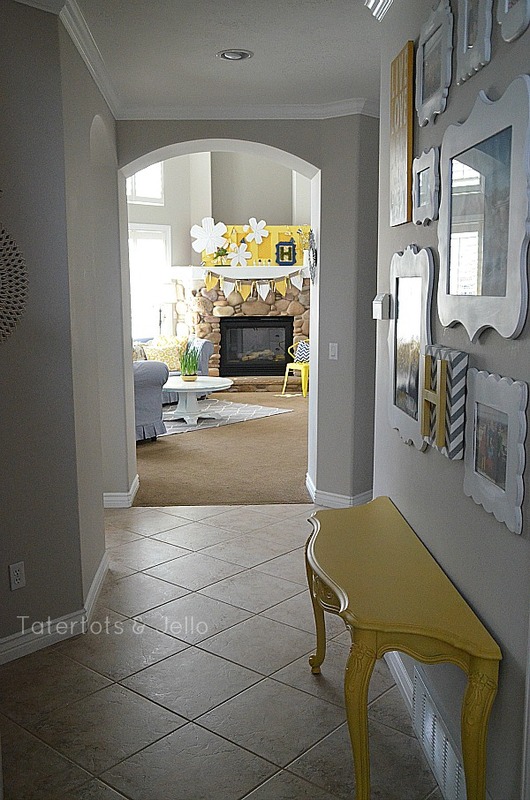 Jen, Love your pops of yellow! It just makes me smile! Thanks Angelina!! I just think you are so sweet and amazing. Thanks for taking the time to comment. I really love the bright and cheerful feeling this mantel gives our home. 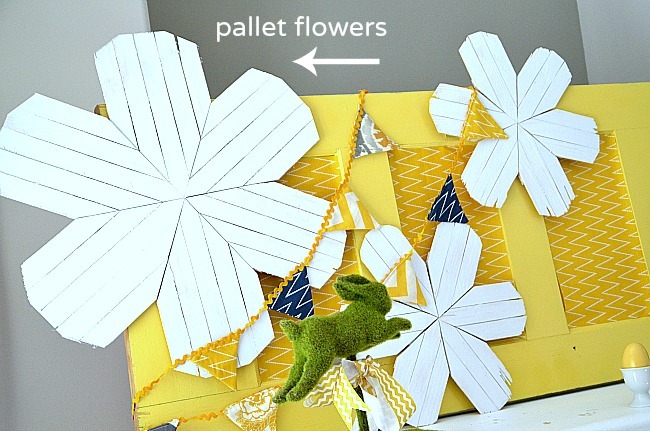 Yes, the flowers are made out of wood shims – which was really fun to create. I also made some stars for the Fourth of July too! This is so fabulous!! These were the colors for my wedding and I love them!! Oh my goodness – that is so cool. I bet your wedding was so lovely. I love those colors and an just imagine how pretty they would be for a wedding!! Thanks Angie!! Oh no – I don’t know why it isn’t updating. All of this technology is so hard to keep up on. I will see if I can figure that out. THanks Angie!! I appreciate you stopping by so much!! I love those colors! Such a beautiful job Jen! Thanks McKenzie!! It took me like a week to figure out. You know when you have a project that just takes a while to come together?? This was that project for me. But I really do love how it turned out. Thanks for stopping by my friend!! I love everything about this. It just looks and feels happy. And those flowers are awesome. Thanks Sam!! It was fun to come up with the flower idea. I don’t think it’s been done before and it’s always so fun to think of something new and see if come to life. Thanks for pinning Denise – I appreciate it so much. And thanks for stopping by and commenting – you are so sweet! It’s beautiful!! Definitely looks like spring. Thanks Rachel!! I can’t wait for Spring!! I am so ready for it!!! Oh, my. It’s SO pretty! Love, love, love the yellow! Thanks Nancy!! Yellow just makes me so happy. It’s been such a snowy winter here. The sun finally came out and it’s going to be in the 60’s this week. I am so excited!! I cannot believe you made those using shims! I am gonna have to grab some of those next time I am at Lowe’s! Love, love, love the flowers! 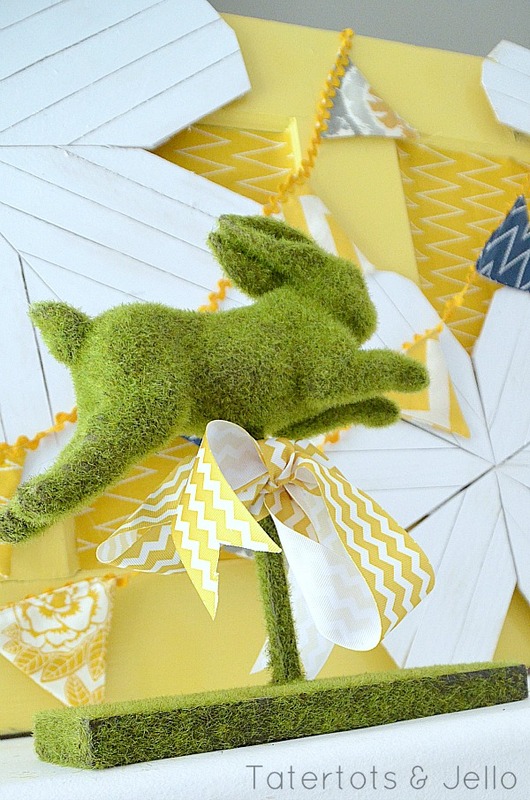 I NEED that moss covered bunny…to die for! Have a fabulous day, Jen! Barbara — you really made my day. Sometimes I wonder if what I am doing really matters. Thank you for your comment and thank you for commenting. I really appreciate it so much.